Primary school children across the UK showed off their digital skills as part of Chinese New Year celebrations this week. Pupils from Discovery Education’s partner schools used innovative digital resources from the Discovery Education Espresso service to learn about the 15 day festival, which this year marks the start of the Year of The Monkey. As part of the celebrations pupils watched a special animated film – The Great Race, which tells the story of the Chinese Zodiac, and shows why each year has an animal name. The lively interactive video is the centrepiece of Discovery Education Espresso’s Chinese New Year module, which includes a whole range of digital resources linked to each area of the curriculum. With Chinese-themed activities in maths, literacy and art, pupils enjoyed taking part in online Sudoku games, completing a Chinese dragon number line, reading ebooks about Chinese culture, and making a Chinese dragon. 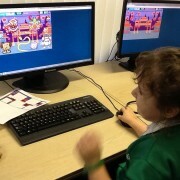 They also had the opportunity to put their computer programming skills to the test, by coding a Chinese Zodiac themed game, a new and timely addition to the Discovery Education Coding service. Discovery Education Espresso is an award winning, video-rich digital learning service for primary schools. With nearly 20,000 digital media resources, which can be applied to any lesson, the service supports the delivery of the National Curriculum and helps teachers to integrate digital media into everyday learning.